Stretching north to south in western Virginia, the Blue Ridge Mountains loom like a wall against the sky. Although not especially high, their summits offer splendid views in all directions. Westward the panorama includes not only the Shenandoah Valley with its patchwork of towns and farmlands, but often two or three ridges of the distant Appalachian ranges as well; to the east the view encompasses the rolling uplands of the Piedmont Plateau and, occasionally, glimpses of the Tidewater lowlands beyond; and to the north and south there is peak after rounded peak of the Blue Ridge itself, rich green nearby, misty blue in the middle ground, and in the distance fading into the clouds. 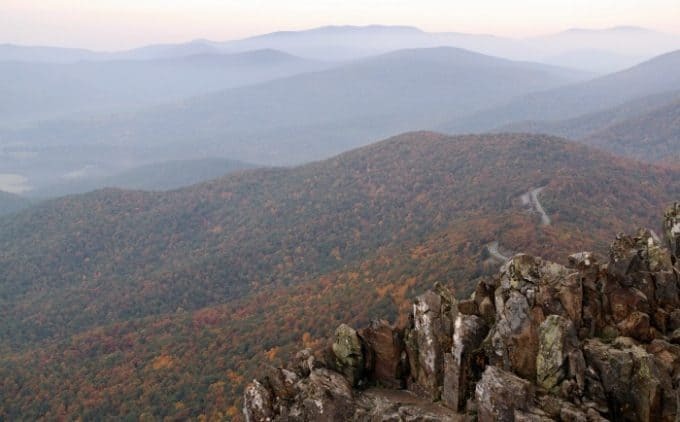 These are the glory spots of Shenandoah National Park, these timeworn peaks that drop away to heavily forested slopes laced with streams and singing waterfalls. Here visitors from the lowlands find solace in an island of wilderness that seems as ancient as the mountains themselves. Strangely, though, this wilderness at Shenandoah is a testimony to the vitality of nature for, not so long ago, these slopes were largely bare of trees. Generations of mountain folk lived here, clearing the forests for croplands and tending their sheep and cattle on upland pastures. Loggers moved in after the Civil War, removing timber to rebuild structures that had been destroyed in the valley. And forest fires were frequent. Then, early in this century, declining resourced forced many of the mountain people to leave the Blue Ridge and seek their livelihoods elsewhere. Shrubs moved in on the abandoned fields and pastures, then thickets of saplings took over, and before long the forest had returned. So successful was nature’s reclamation, in fact, that more than 95 percent of the park is now completely reforested. Just as the look of the Blue Ridge has changed over recent decades, so it continues to change with the passing seasons. Each is punctuated by its own special events and permeated by a distinctive mood. Spring, for example, is the sneaky season at Shenandoah. It creeps up the mountains with a subtle wave of color as buds expand on winter-bare twigs and new leaves gradually unfurl. The tones, pale pastels at first, eventually deepen to bold, bright green by the time the leaves are fully formed. One rule of thumb has spring climbing the slopes at a rate of 100 feet a day, with the trees finally leafing out on the highest peaks late in May. But anyone waiting for the greening of the forest canopy misses half the show, for much of the drama of the annual reawakening takes place underfoot. As the soil warms with each lengthening day, wildflowers spring to life everywhere and in many cases rush to blossom and set seed before the full-blown canopy overhead blots out the warming sun. Among the earliest of the seasonal performers is the dainty little hepatica. As if impatient to get started, its fuzzy gray buds rise above dead leaves littering the forest floor and open to delicate pink or lavender blossoms even before the ice has melted from nearby waterfalls. Another, coltsfoot, yellow and looking much like a leafless dandelion, pops up in clusters along the roadsides as treefrogs begin their nightly choruses from the edges of half-frozen puddles of melting snow. Once the blossoming starts, it bursts through the woods like wildfire. Trilliums, nearly symmetrical lilies with three petals, three sepals, and three leaves, open their stately flowers everywhere. Bloodroots, as white, bright, and cheerful as daisies, spangle the forest floor. Elsewhere, among the unfurling fiddleheads of ferns, the woodlands are brightened with violets, wild geraniums, dainty, ground-hugging hepaticas, pink and yellow lady’s slippers, and hosts of others, while the edges of wet places are accented with the golden yellow blooms of marsh marigolds. Another special favorite, the wonderfully fragrant trailing arbutus, garlands the slopes with clusters of tiny pink and white, trumpetlike flowers tucked among its evergreen leaves. Flowering trees and shrubs add to the spectacle. Redbuds proclaim their identity even from afar; every twig on the little trees is covered with clusters of shocking-pink flowers that resemble miniature sweet peas. Hawthorns and wild cherries follow a few days later, along with serviceberries, which are for a time transformed into billowing clouds as the petals unfolded on thousands of delicate white blooms. The dogwoods soon take over with yet another display of sparkling white, and wild azaleas explode into splashes of pink while the trees all around them are still leafless. And throughout it all, animal life is reawakening too. Black bears, lean and hungry after their long winter rest, begin to roam the woods in search of food. Butterflies burst from pupal cases and spread their wings. Salamanders emerge from hibernation and begin their silent mating rituals. And the birds return, warblers and thrushes, wrens and vireos, throngs and throngs of the, some just to pass through on their way to nesting grounds farther north, others to stay and sing and raise their broods here in the Blue Ridge. One of the first arrivals, and for many, one of the most welcome signs of spring, is the woodcock. Early in March, the chunky, mottled brown birds return to Big Meadows, a grassy tableland high on the ridges where they spend the summer. And there for several weeks, they put on a nightly show for anyone willing to spend an hour or so standing quietly in the evening chill. Just after sunset, in the deepening twilight, the male emerges from the brushy area where he has hidden by day and claims an open space for his stage. There he struts about for a minute or two, making a sound between a squeak and a buzz. Then suddenly he bursts into the air and spirals up to a height of 300 feet or so, with the wind causing a soft twittering sound as it passes between his outer wing feathers; there he circles a few times, then zigzags back to the ground, warbling all the way. Back on the ground, he resumes his strutting and then, without warning, flashes upward on another of his dizzying flights. After a few repetitions of these maneuvers, he may be joined by a female who has been hiding quietly among the grasses and consents to be his male. If so, that marks the end of the show for the evening. Otherwise, he will continue until full darkness falls, and on moonlit nights he may never quit until dawn.